Well. I know I've been meaning to finalise this giveaway for a few days now. Unfortunately, NaNoWriMo, grad school assignments, family life, and personal illness have all been conspiring against me. But I finally managed to squeeze in a bit of time to get this sorted. If you're curious how I came up with this, I used Random.org to choose the winner. Congratulations, Sherina! Please email me your mailing address (please send to: shaicoggins AT gmail DOT com) so I can send the book to you asap. I'm a NaNoWriMo '09 Rebel! Just when I thought I can't be a NaNoWriMo '09 Participant, I found out all about NaNoWriMo Rebels. So today, the official start date of NaNo, I decided... Well, why not? Yes, I'm now officially counting myself in a NaNoWriMo participant. A rebel one, yes. But, a participant nevertheless. How am I a rebel? I'd be having my "end date" earlier than everyone else. Since I'm travelling on the 28th of November onwards, I have to try and complete 50K words before that day. I know this lessens my chances of 'winning'... But hey, that's fine. I just want to be part of this fun journey! There's something about the solidarity of the writing community this time of the year that makes me just want to be part of it, win or not. What about you? Are you taking part in NaNoWriMo this year? Are you joining the rebellion too? Do you have a home office where you do all your writing? What tools do you own for your writing craft? This article, 10 Essential Items in a Telecommuting Home, is not specifically geared for writers. But, the ideas shared in it can be used by a writer looking in to setting up a home office. As part of my "Inspiration Café" series, I've been interviewing some authors. Here's a snippet from the interview I did with Ann Whitford Paul, the author of the book, "Writing Picture Books: A Hands-On Guide from Story Creation to Publication"
Can you please share with us how you got started as a picture book author? That’s easy. I became inspired to write picture books after years of reading them to my four children. I loved the closeness, the quiet, and the focus together on a book. It was such a pleasure I decided to try and write books that other adults and children could share together. How many picture books have you authored/published - and can you tell us a bit about one or two of them? I’ve authored hundreds of picture book manuscripts and have sold 20. However two of them were cancelled because an editor left and because an editor “lost enthusiasm over the project.” Many of our stories no matter how we work on them, don’t turn out. I’ve also sold one adult book. A new book TORTUGA (the Spanish word for Tortoise) IN TROUBLE published just this year is a retelling of Little Red Riding Hood with a Spanish twist. This is part of a series I’ve written that introduces children to some Spanish vocabulary with the hopes that they will be inspired to learn Spanish. Another new book titled IF ANIMALS KISSED GOOD NIGHT is a rhymed picture book about how animals might kiss good night. It grew out of a game my third child, Alan, and I used to play guessing how Snakes and Elephants and other animals would kiss. What inspires you to write these picture books? About five years ago, I was in Africa on an airplane next to a 9 year old boy from Afghanistan. He spoke English perfectly. In response to my question, he said he’d been studying English for just one year. Then, and this is the embarrassing part, he asked, “How many languages do you speak?” I must admit I told a fib. I said, “one and one half,” hoping that my two years of college French counted for something, even though I would be hard pressed to carry on a conversation. While we now have many immigrants in our country we speak more than one language, many still persist in thinking that just speaking English is enough. With the shrinking of our world through travel, television and internet, we all should learn another language. . . maybe two. I now study Spanish and thrilled to be able to speak not only in the present, but also in the past and future. What's the best advice you have for people who wish to get started in writing picture books? Spend a lot of time with your young audience. Pay attention to what are big issues for them . . . being left with a babysitter, dealing with a bully at school, a favorite shirt is too dirty to wear. Write about what matters to them, not to you. Another bit of advice is to read picture books . . . lots and lots of them. I also type them up and even make a dummy book to see which page the print falls on. Do this and you’ll learn lots about pacing and page turns and language. I would not be a good promoter if I didn’t give a plug to my WRITING PICTURE BOOKS which I wish I’d had when I first started out. >> Read the rest of Ann Whitford Paul's Interview at Studio Notes. 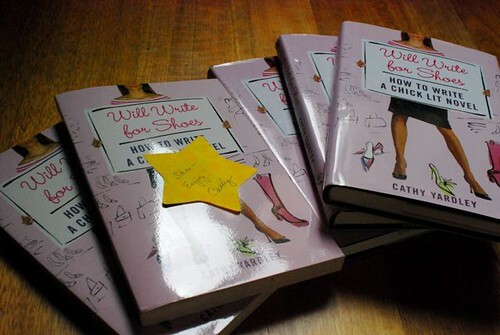 This was part of WOW - Women on Writing! Blog Tours. Grand plans are what I had when I started the year. Grand plans to update this site more often. Grand plans in writing. Grand plans in getting published. But, things went a bit awry at the start of 2009. A few unexpected events occurred and I sort of got a bit lost for a short time. At least, even though I have fallen short by a long way when it comes to updating eWriteLife, I can say that my writing has definitely taken off this year. I haven't been this consumed about writing in a very long time. Sure, my publications credit this year aren't all that grand. But, at least, they started ticking along again past blogs and private journals. Plus, I have a number of ongoing writing projects that I'm excited about. Including the possibility of getting better publication credits again starting early in 2010. Including print. So, I can't help but be excited. That's why I'm hoping to resurrect the grand plans somewhat for this site. And, carry on with the writing and publishing plans. What about you? How're your plans and your writing in 2009 going? Have a Great Writing Year in 2009! Hello and welcome to another year! So, are you as excited about 2009 as I am? For some reason, I am feeling more optimistic about doing more writing this year than I have ever done in the last couple of years. And, I'm already looking forward to trying new and different things once again. Perhaps, even start on a good project or two. What about you? Have you included "writing" in your New Year's Plans/Resolutions? What are your goals for writing this year? Whatever they may be, I wish you all the best. May 2009 bring you a lot of wonderful writing moments.